Tea Tree Oil Shampoo has been extremely popular for fighting dandruff and dry scalp conditions such as peeling patches of skin on the scalp and itchiness. It also occurs as an ingredient in shampoos designed to fight lice infestation and prevent hair loss but is recommended for oily greasy hair as well. Tea Tree Oil has long been used for hair as well as skin due its anti-fungal and anti-bacterial properties. When it comes to hair benefits, Tea Tree is not only good for dealing with dry scalp and dander but also promoting the health and beauty of your hair, resulting in hair that look shiny and have better texture. Some people also do review that tea tree improves the thickness of their hair and speeds up hair growth. So, here is a look at 16 of the best Tea Tree Oil Shampoos and what top user reviews say. This Maple Holistics Natural Therapy Shampoo for men, women and children is made up of 98 natural compounds and is paraben and sulfate free. The company recommends this product for dandruff, dry itchy as well as flaky scalp, hair loss and regrowth and even as a lice prevention shampoo. Among its ingredients and apart from Tea tree, it also contains botanical Keratin, Jojoba and Argan Oil as well as Rosemary and Lavender essential oils. User reviews about this natural anti-fungal and anti-bacterial shampoo are very positive. People find that it leaves their scalp feeling wonderful and their hair feeling clean. It relieves itching and reduces flaking. Hair is left soft, moisturized and tangle free. Users also review that it helps with lice prevention and doesn’t leave your hair feeling oily. This Paul Mitchell Tea Tree Special Shampoo is one of the most popular Tea Tree shampoos among users who have it top in their shopping lists. 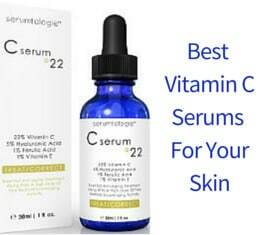 It comes in a 33.8 ounce bottle and includes peppermint, Lavender, and Aloe Vera leaf juice among its ingredients. It does contain SLS though which is a foaming agent that can cause dryness. The company recommends this product as the perfect way to remove impurities from your hair, leaving it moisturized, shiny and healthy. In addition, it can be used on color treated hair and is suitable for all types of hair. Product ratings and reviews are very good. Users feel that it leaves their hair clean, thick and healthy. It works equally well for both men and women, and people say that it really does help relieve dry scalp. It is refreshing and doesn’t leave the hair feeling oily. 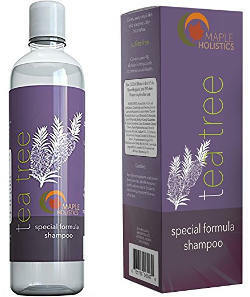 This Desert Essence Tea Tree Replenishing Shampoo is a good quality natural tee tree shampoo that contains Australian Tea Tree Oil and other natural ingredients such as peppermint oil, eucalyptus leaf oil, yucca cactus, menthol and others. It is 100% vegan as well as cruelty free and pH balanced. It is made in the USA and is free of alcohol, dyes, synthetic fragrance, artificial detergents and other harmful for the skin and hair ingredients. Its bottle is made of biodegradable material. According to the company, this is an effective and gentle shampoo to cleanse hair without causing dryness while also promoting the balance of your scalp and the moisture of your hair. Its soothing properties improve scalp’s circulation while the Babassu oil adds shine to the hair. Users are very pleased with this product’s performance. It keeps dandruff at bay and leaves hair clean but not dry, supple, shiny and flake-free. It offers a clean feeling and hair that is hydrated and shiny. Reviews from people with thick dry and frizzy hair say that their hair feels hydrated and super soft. It is also great for oily hair and some people have mentioned that they don’t even need to use a conditioner after using this shampoo. Finally, it lathers well and smells great. This Men’s Tea Tree oil infused shampoo comes in 6 fluid ounces with a 100% satisfaction guarantee and is not tested on animals. It is also made in the USA. The manufacturer claims it is good for eliminating dandruff and dryness in the scalp as well as for preventing hair loss. Consumer reviews are extremely good. Users report that it leaves their hair clean and thicker with more body. It also reduces dandruff. They like its minty scent and find that it leaves their hair soft and smooth and that it controls oil production in the scalp well. 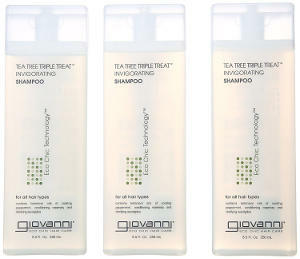 This Giovanni Tea Tree shampoo comes in a package of 3-8 ounce bottles and is full of healthy organic ingredients like organic Tea Tree on the top of the list, peppermint oil, eucalyptus oil, rosemary, thyme, chamomile, clary sage, vitamin E, grapefruit seed and others. It does not contain SLS and is cruelty free. According to the company, it alleviates dry flaking scalp, gets rid of all dirt, oil and build-up, and increases circulation of the scalp to provide you with a refreshed and invigorating feeling. People like the fact that this product leaves their hair very clean, shiny, soft and manageable without irritating their scalp. 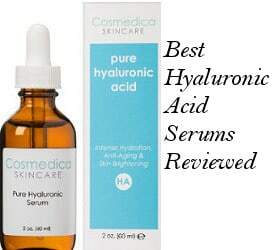 It has a nice scent and works well on oily hair without weighing it down so it has more body. This Trader Joe’s Tea Tree Pack contains a tea tree shampoo and a conditioner that are perfectly combined to clean hair and protect its moisture, improve its manageability and add shine to it. These products contain organic botanicals and are free of animal products and sulfates. They are also cruelty free. Users are very pleased with the effectiveness of this tea tree oil product combination. They report that it heals itchy scalp and peeling skin on it, it stops dandruff and helps with psoriasis. It gives a tingly feeling which is cooling, and the product leaves their hair clean but not stripped of its natural oils as well as soft and without frizzes. People also like the fact that the conditioner does not feel oily or greasy. Avalon Organics is a quality brand that creates natural and organic skin and hair care products that are NSF/ANSI 305 certified. I have tried various of their shampoos like the rosemary shampoo, the ylang-ylang and the peppermint and I have been very pleased with their quality. The Tea Tree Mint Normalizing Shampoo promises to treat dry and itchy scalp as well as cleanse the hair and scalp restoring hydration and boosting a healthy circulation. It makes hair soft, manageable and shiny as well as leaves the scalp balanced and relieved. Some of its natural and organic ingredients include tea tree of course, mint, chamomile, eucalyptus, aloe vera leaf juice, bergamot fruit extract, rosemary leaf extract and others. This natural formula is 100% vegan friendly and free of GMOs, sulfates, phtlalates, artificial colors or synthetic fragrances, parabens and other preservatives. The bottle is biodegradable. Users’ reviews about this natural tea tree shampoo are very good. People say that it leaves scalp clear with a fresh cooled feeling and has eliminated dry areas on it. Some people have also reported thicker hair after using this product. It feels great on the hair, doesn’t cause dandruff and rinses clean. According to people’s comments, it does not lather so well but this is obviously due to the lack of chemical foaming agents such as SLS. 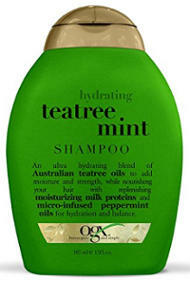 This OGX Shampoo comes in a 13 ounce bottle and contains Australian tea tree oil, peppermint oil and milk proteins. It is sulfate free and paraben free but does contain SLS, fragrance, colorants and some other preservatives. According to the company, this product is nourishing and moisturizing, and leaves your hair feeling refreshed. User reviews are very good. People like that it lathers well and leaves their hair feeling really refreshed and great. A little of it goes a long way and some users say that they have had less itchy scalp after using it and that it doesn’t strip their hair of its natural oils. It is gentle on color treated hair and leaves hair soft and manageable. Moreover, its price is another big plus. Another natural and organic certified shampoo from Avalon Organics containing Tea Tree essential oil. Some of the ingredients of this Scalp Treatment Tea Tree Shampoo are Aloe Vera, Quinoa Protein, Beta-Glucan, Vitamin E, calendula flower extract and chamomile extract. Exactly as the previously reviewed Avalon Organics Tea Tree version, this one is also free of all harmful chemicals and is 100% vegan friendly. This is a gentle yet effective tea tree formula that claims to cleanse your hair and scalp, soothing irritation and balancing moisture, which results in soft, shiny and healthy hair as well as scalp comfort that lasts. Users love this product because it works great. It makes hair shiny, soft and manageable while it is also color-safe. Some people with fine thin hair have reported that their hair feels thicker and it also works well with hair fall. 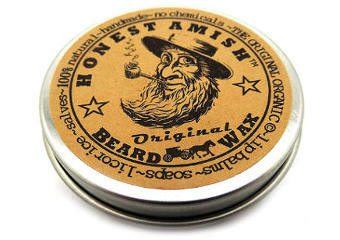 The quantity lasts long and the smell is great. This quality shampoo is particularly beneficial for oily types of hair as well as dandruff and has shown some positive results to scalp flaking due to psoriasis scalp condition. 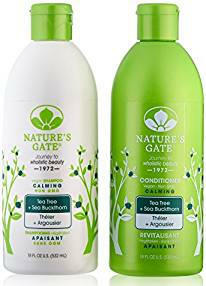 This Nature’s Gate Tea Tree and Sea Buckthorn Duo Set includes a shampoo and a conditioner that are free of parabens, SLS, phthalates and butylene glycol. They are also cruelty free and made in the USA. They are ideal for everyday use and, apart from Tea Tree and Sea Buckthorn, they also contain such healthy ingredients as jojoba oil, borage seed oil, vitamins C and E, chamomile, panthenol, witch hazel and soy proteins. The company recommends these products for irritated and flaky scalp but they are also good at maintaining hair healthy and shiny. People are very pleased with their effectiveness and quality. They say that the shampoo works great for oily and flaky scalps. It stops itchiness on the scalp while it also gets rid of dandruff and is good for psoriasis. Most people love its smell while few others find it a bit medicinal. Overall, it improves the health of the hair and makes it really shiny. This CHI Tea Tree Oil Shampoo contains Tea tree Oil as well as Lavender Oil and Peppermint Oil. It is free of sulfates and parabens, and, according to the company, it is good for cleansing the hair and scalp, balancing the natural oils as well as strengthening the hair cuticles. It boosts hydration levels while also adding shine to the hair. Users say that this product is very good at controlling oily scalp and dandruff while it also helps with thin hair. It feels refreshing and invigorating, lathers well and rinses clean while the hair feels light and clean after each use. This Honeydew dandruff shampoo with tea tree oil comes in an 8 ounce bottle with a 100% full money back guarantee. It contains potent tea tree oil although not at the top of the list and some other hair healthy ingredients including rosemary and jojoba oil. It is also free of sulfates. According to the company, this product is good for alleviating flaking and itchiness as well as dandruff. This clarifying tea tree oil shampoo has repairing and hair strengthening properties. It is suitable for color treated as well as keratin treated hair and can be used by both men and women. Users’ reviews mention that it leaves their hair clean and shining while relieving itching scalp and dandruff. It has a nice scent and makes hair healthier, lightweight and soft. This Tea Tree Oil Shampoo comes in a 1 liter bottle and according to the manufacturer, it cleanses the scalp, leaving it tingly, and makes hair manageable, shiny and soft. It contains Tea Tree, peppermint and eucalyptus but is not free of SLS. When compared to Paul Mitchell Tea Tree Shampoo, there are people that find this version very good, others that can’t really compare the quality and effectiveness of Paul Mitchell to this and few others that just find it good enough for the price. More specifically, users say that it gets rid of build-up, leaving a fresh feeling and a cool tingling that is not strong. It also helps some people with hair greasiness and scalp itchiness as well as dandruff while they find its smell stronger than the Paul Mitchell shampoo. 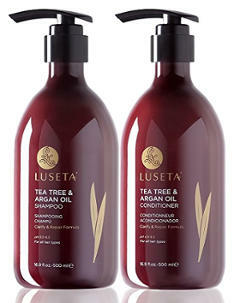 This Luseta Tea Tree & Argan Oil Products Set contains a shampoo (pH 5.5-6.5) and a conditioner (pH 4.5-5.5.) It is free of sulfates, parabens and phosphate, and is safe for color treated hair. Its key ingredients are Tea Tree Oil and Argan Oil combined with a number of other ingredients such as lavender oil and peppermint oil. It also contains perfume which is a synthetically produced ingredient, color, and few others. The company promises effective cleansing that leaves the hair and scalp refreshed, moisturized and full of shine. Some people like these two products while others don’t find the strength of the Tea Tree contained in this set adequate enough or this product natural and therapeutic enough. This Jason Tea Tree Oil Shampoo is recommended for normalizing itchy, dry and flaky scalp. The company states that it gets rid of dead skin cells as well as dandruff. It also strengthens hair and makes it soft, manageable and shiny. It contains Australian Tea Tree Oil and a number of other natural ingredients while it is free of animal-by products and SLS. User reviews relating to its effectiveness in dealing with itchy scalp are somewhat mixed and not overall very positive. 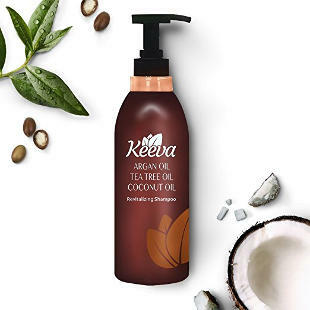 Apart from Tea Tree oil that is sourced from China, Argan Oil and Coconut Oil, this Keeva Revitalizing Shampoo contains some other natural ingredients including aloe vera extract, Damascus Rose Water, sweet almond oil, shea butter, witch hazel water and others. Nevertheless, its main ingredient which is Tea Tree is listed in the end of the list and therefore it doesn’t seem to be the main ingredient of this product or exist in adequate amounts in the formula. Although the company states that this shampoo is free of silicones, parabens and sulfates, some people have complained that this description is not accurate. 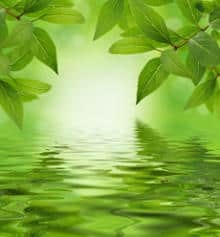 In conclusion, if you are looking for the best Tea Tree Oil Shampoos to deal with itchy or oily scalp issues as well as a number of other hair and scalp problems, the above list will help you find some top reviewed options as well as some less popular choices.